I have often been asked “what is the difference between a beard balm and a beard butter”, the simple answer is beeswax or in plant based products just wax. A butter therefore is softer, some are poured and some have are whipped and the Savage Alchemy butters are poured. However they are not a soft butter and a butter should as the name implies, be creamy soft! It takes longer to work in my hands than any butter I have used previously but you do get a buttery consistency once you have done that and it is then easily worked into the beard. I didn’t feel like my beard was as nourished as well as it should be when using a beard butter, however, my beard does feel slightly softer and it looks good. The scent, well now we are talking! It is a burst of freshness, citrus fresh and very lemony and almost like a lemon sherbet. The scent also lasts quite well on the beard. I really like the scent! 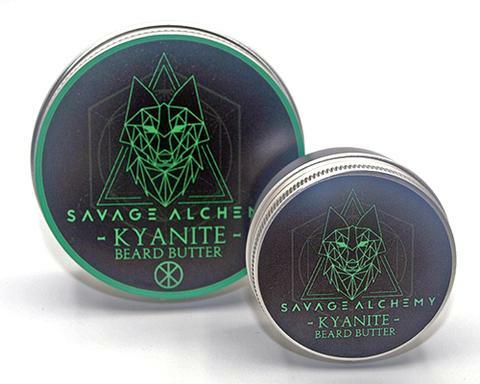 The Savage Alchemy Kyanite Beard Butter comes in a screw top tin and is available in two sizes, 30g £6.99 & 60g £12.99 from the website.